Isn’t it funny how things turn out? Never seems that way at the time, but hindsight and all that brings perspective. 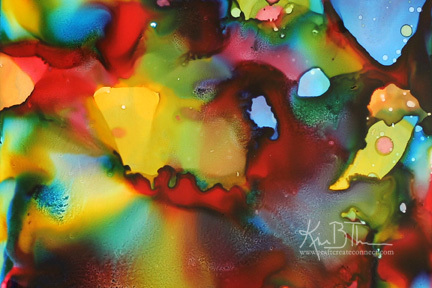 As you know, when I started playing with alcohol inks, I let them freely roam. Then I began to try to learn how to control them. Just when I thought I had, they showed me yet again, I can not control the things that I can not control. I began a simple color study, on yupo paper (cut to 4×6) or you could likewise use Ranger Adirondack Glossy Paper along with using Ranger Adirondack Alcohol Ink in the three primary colors (or as close as I could get with alcohol inks- Red Pepper, Sunshine Yellow and Sailboat Blue ) and Ranger Adirondack Blending Solution. I was attempting to recreate an image I had created earlier but in different color palette. So this was the intention I had. The result however, was something quite different. A light layer of blending solution was spread evenly across the yupo surface and then taking the blue bottle, small round circles were created around the image when barely touching the drip onto the yupo surface. Likewise, larger circles were created holding the ink perpendicular to the paper and allowing gravity to pull the ink out rather then squeezing excessively. This process was repeated with red and yellow until the surface was covered. Minimal drying time was allowed. The process was repeated, dripping red into yellow or blue to create the secondary colors and this was repeated with yellow and blue as well. The resultant image was similar to the one above when I left it to dry permanently. When I returned to take a look, this is what I found. The colors and the blending solution had continued to move and shift, likely with the currents created by our blown air heating system and a great deal of ink on the surface. I had started this project in order to get “into my right brain, creative groove” for some journaling/brain dumping I am doing for several other projects. The result seemed perfect for the brain dumping I am doing and the journal process itself. All of the universe conspires for your greatest good, you need to simply be open to it. You weren’t put you on the earth to suffer but rather to thrive and reflect all of the awesome wonder through you. Take three primary colors and add them together and the color variation abounds… so to with people… and isn’t it beautiful! 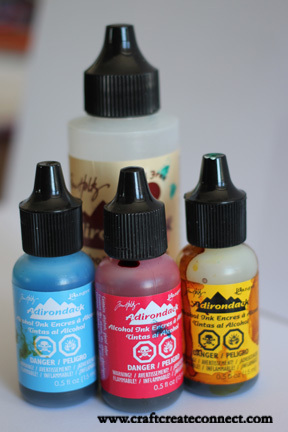 If alcohol ink interests you, stay tuned for an exciting collaborative ebook announcement! Coming soon!